Last year’s $1,000 buy-in No Limit Holdem tournament was dubbed the “Stimulus Special” and it was such a hit that the WSOP brass decided not only to bring it back for 2010, but throw a little water on it and watch it multiply like Gremlins! 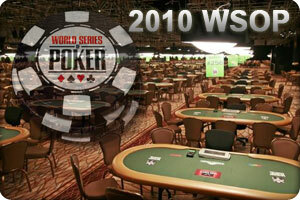 The 2010 WSOP has a total of six $1,000 buy-in No Limit events on the schedule, in addition to the $1k Ladies tournament and the $1k Seniors tournament. So, if you’re a woman over 50 you could enter 7 tournaments for about 2/3 the price of the Main Event. With huge fields expected the $1,000 tournaments are broken up into two Day 1’s, and Day 1a of the first $1k tourney didn’t disappoint, with a total of 2,601 players registering for the event. The carnage started early and lasted throughout the tournament as only 290 players made it through to day 2 –which will take place on Monday. Day 1b will likely match Day 1a’s numbers, so the tournament’s prize-pool will easily exceed $5 million, which makes the $1k tournaments some of the most lucrative at the WSOP –not only monetarily, but the lower buy-in also attracts less skilled players who want to take a chance at a big score. This entry was posted on Sunday, May 30th, 2010 at 8:54 am and is filed under Poker News. You can follow any responses to this entry through the RSS 2.0 feed. You can leave a response, or trackback from your own site.